The Parrot Suite. Beautifully renovated, one bedroom condotel. Sleeps 2. King bed. 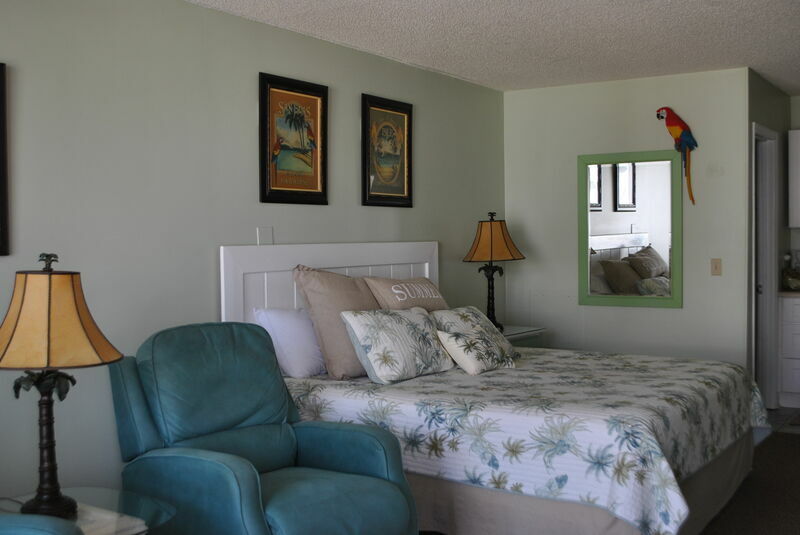 Centrally located on beautiful Ocean Isle Beach, one block from the ocean and fishing pier, walking distance to local restaurants and activities. Condotel is comfortably appointed with king bed, two reclining chairs and a bistro table. 50" Flatscreen TV and DVD player. Room also has a kitchenette with small microwave, mini refrigerator, coffee maker and flatware and dishes. New (2018) tiled shower, hairdryer. On site outdoor swimming pool for your enjoyment! NON SMOKING. All condos may be rented on a nightly basis please contact office to reserve. Free Wireless Internet! !